This month we have the Qi moving into it’s home locations. The annual and monthly Qi are now both the same in all sections of our grid. This is good in that the favorable Qi is twice as strong now but this also means the center of every building in the world is very negative this month so take precautions by adding extra Metal to the center of your home as well as remove any red colored items and lights. I also like to err on the side of caution and I don’t wear red as Qi will cling to you if you happen to walk through a particularly bad area. Children are especially effected by this and I recommend neutral clothing colors for them until February of 2013. Another problem area this month is the SW so place Metal in that section of your grid as well. 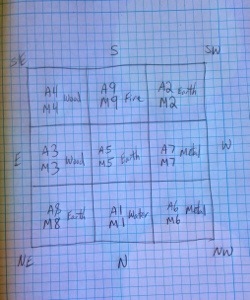 If you have not yet found your grid lines in your home, I highly recommend doing so. These lines are very important and can cause much damage if you happen to be sleeping with one running through or across your body. If your home has had no remodeling or additions added and is rectangular or square it is easy to find your grid lines. While inside, measure from outside wall to outside wall. Then divide the total by three. You will do this for the length as well as the width and wind up with nine equal sections like in the picture below. If you have additions or an oddly shaped home with many roofs then you should contact an American Feng Shui Certified Practitioner to help you find your lines. I recommend that you do this anyway as knowing the Qi pattern of your home is very helpful and can help alleviate most problems. Please feel free to contact me with questions or concerns. I recently published a book which is available on Amazon for kindle. 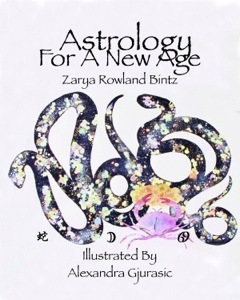 It looks at astrology in a new way and features illustrations by Alexandra Gjurasic. Please let me know what you think.